Sometimes it’s hard to get kids to eat vegetables. But potatoes generally aren’t one of them. Show me a kid who doesn’t like almost any kind of spuds, and I’ll show you one who is fussy about just about everything. 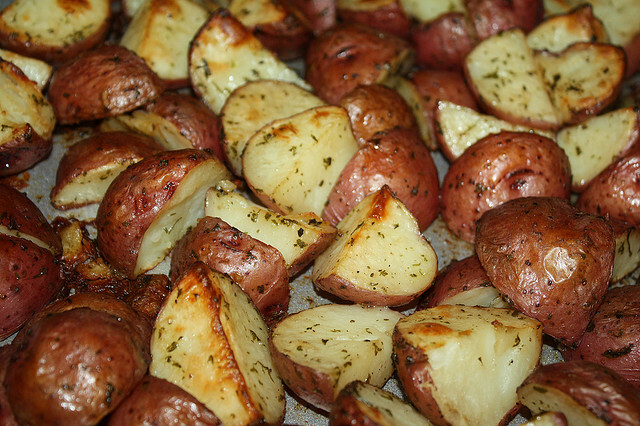 One of our favorite ways to prepare potatoes are roasted, coated with a bit of butter and olive oil and seasoned with salt, pepper, garlic powder, Cajun seasoning, red pepper flakes and dried parsley. These potatoes go great with just about anything you want to serve with them. We especially like them with hamburgers, hot dogs, brats, sausage and those sorts of foods. The second recipe is one I came across that looks pretty good and is one we’ll have to try. Place potatoes in a large bowl. Add melted butter and olive oil along with seasonings. Mix thoroughly. Place potatoes on cookie sheet (with sides) that has been sprayed with Pam. Bake for 30 to 40 minutes, checking occasionally to flip potatoes. Serve when crispy and brown. In a large bowl, whisk together the mustard, olive oil, paprika, garlic powder, salt and pepper. Add in the cubed potatoes and stir to coat all the potatoes well. Place on 2 baking sheets sprayed with cooking spray, keeping the potatoes in a single layer. Bake in the oven for 25 minutes, then remove from the oven and turn the potatoes over. Place back in the oven another 20 to 25 minutes until the potatoes are crispy and brown. Notes: You can make the dressing and coat the potatoes ahead of time. Just keep in the refrigerator until you’re ready to cook.